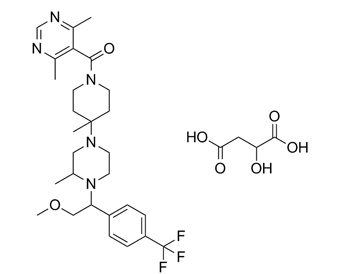 Vicriviroc, also known as SCH 417690 and SCH-D, is a potent, orally active and selective CCR5 entry inhibitor of HIV-1. Vicriviroc is effective at nanomolar concentrations, it can be administered once daily. Vicriviroc binds to a small hydrophobic pocket between the transmembrane helices near the extracellular surface of the CCR5 receptor. Binding to this pocket induces a conformational change of the extracellular segment of CCR5 and prevents binding of gp120 to the target cell, consequently preventing the virus from entering the target cell at all.
. Tagat JR, et al. Piperazine-based CCR5 antagonists as HIV-1 inhibitors. IV. Discovery of 1-[(4,6-dimethyl-5-pyrimidinyl)carbonyl]- 4-[4-[2-methoxy-1(R)-4-(trifluoromethyl)phenyl]ethyl-3(S)-methyl-1-piperazinyl]- 4-methylpiperidine (Sch-417690/Sch-D), a potent, highly selective, and orally bioavailable CCR5 antagonist. J Med Chem. 2004 May 6;47(10):2405-8.
. Strizki JM, et al. Discovery and characterization of vicriviroc (SCH 417690), a CCR5 antagonist with potent activity against human immunodeficiency virus type 1. Antimicrob Agents Chemother. 2005 Dec;49(12):4911-9.